Ever since I gave up gluten more than three years ago, Elana Amsterdam of Elana’s Pantry has been my go-to girl. She has provided me with recipes, inspiration and the confidence to continue down this path. Sure, there are other food bloggers that I follow including Karina’s Gluten-Free Goddess and The Spunky Coconut by Kelly, but Elana’s Pantry is the one I subscribe to. What keeps me interested is her utter dedication to keeping it simple, natural and low everything. Perhaps you recall some of her influences. She is responsible for our love of cauliflower rice–one of my all-time favorites! Then there is the vegan chocolate pudding and how can we forget the delectable crackers or that creamy chocolate chip ice cream I made a few weeks ago? Elana used to cook exclusively with almond flour, grapeseed oil and agave nectar and it was amazing to see what she came up with using these three ingredients as a base. But now she has branched out and is using quite a bit of coconut oil and coconut flour as well as stevia and honey in lieu of the controversial agave, of which I was never a fan. Her newest cookbook Paleo Cooking from Elana’s Pantry features dozens of recipes that are not just gluten-free but also grain and dairy-free. For those of us with food issues, this is a magical trifecta! With the 4th of July upon us (along with the heat), it’s time to think about a nice, long maybe four-day celebration with lots of friends and plenty of cooking. Since you know we build a holiday around food, this is a great excuse to make something–or a few things–from Elana’s new cookbook. My go-to dessert of choice always has chocolate, but in order to mix it up and cool off in this heat, we need something a bit more refreshing–agreed? 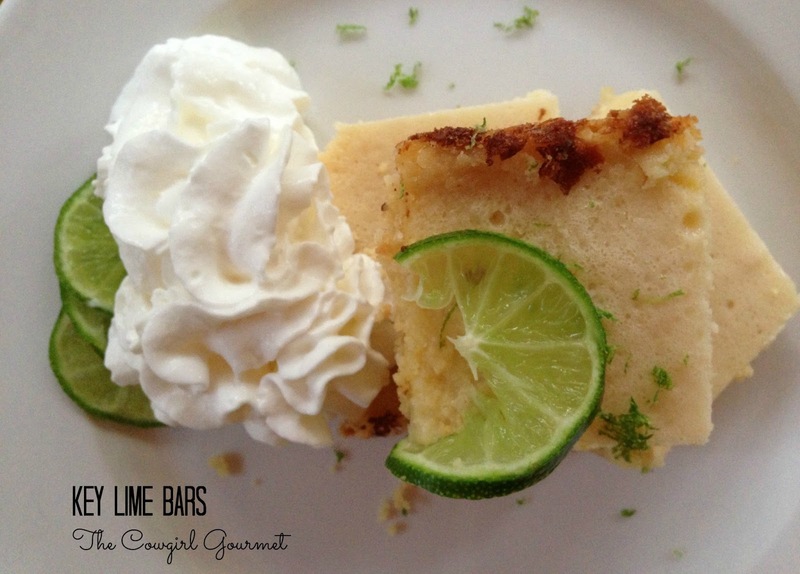 The lime bars stole the show! Sure, the blueberry coffee cake, paleo tortillas and nut-free crackers also made the cut, just not the first round draft pick. Why? Because we love key lime pie!!! It was one of the first dozen dishes I learned to make after I met David. He spent many years living in Florida and knows all about Joe’s Stone Crab‘s fabulous key lime pie. Fortunately, I found their recipe early on in our relationship and have since become the key lime pie queen. My trick? I add lime zest to the crust. It makes all the difference. Considering the Joe’s Stone Crab recipe uses an entire can of sweetened condensed milk, I thought this healthy version might win us over. No surprise, it did, thanks to Elana and her simple approach to never living without! As a self-professed key lime pie aficionado, rest assured this recipe has passed the test of two experts. I love that it's so easy to throw together, uses little sweetener and has no dairy or gluten! The almond meal-based shortbread-like crust pairs beautifully with the tangy yet slightly sweet lime curd-like filling. The added zest in the crust and filling take these bars over the top. For the crust: Preheat the oven to 350 degrees. Grease an 8-inch square baking dish with coconut oil and dust with almond flour. Combine the almond flour and salt in a food processor. Pulse in the coconut oil and stevia (see below) until thoroughly combined. Add in the zest and pulse a few times. The crust will not form a ball, so do not worry when it looks just like it did when you put it in the processor. Dump the mixture into the baking dish and press the dough into the bottom. Bake the crust 12 to 17 minutes, until slightly golden brown. While the crust bakes, prepare the topping. To make the key lime batter: In a high powered blender or regular blender (I used mine on "ice crush" option to enhance the speed), puree the lime juice, eggs, coconut oil, honey and zest until smooth. When the crust is ready, remove it from the oven. Whirl the topping a few more times in the blender to make sure everything is still well mixed and then carefully pour the topping over the hot crust. Return the baking dish to the oven and bake for 18 to 22 minutes, until the topping is golden. Let the bars cool in the dish for 30 minutes and then refrigerate for 2 hours so it sets. Cut into 12 squares and serve. I added a few squirts of whipped cream and the zest of a lime for garnish. Store covered in the fridge for up to 2 days.